Christ of Saint John of the Cross is by far one of the most famous religious paintings of modern day. 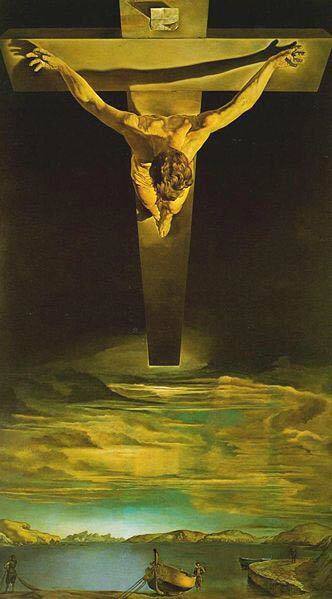 Painted in 1951, iconic painter Salvador Dalí masterfully gave us his unique rendition of Christ. By providing the viewer with an unusual angle of the cross, Dali was able to create an image that was never seen before. A surreal vision of Jesus Christ a year before the painting was completed served as the inspiration for this masterpiece. The religious image came to Dali full of different hues that seemed to stick in his mind. He saw an image of Christ from the view of God. This angle was strategically drawn and the painter used an actual muse to get an accurate perspective on how the body would dangle from a cross. The surrealist style of Salvador Dalí was greatly seen in this painting as there appeared to be an intermix of angles. Dali mixed different hues of blues and greens that illuminate on the canvas to form the sea at eye level. The technical skill is evident as the body of Christ hangs nearly suspended in air. The muscles are intricately painted with flesh tones and shadows that create depth. The viewers’ eye is drawn to the cross as the charcoal black oil paint in the background pushes the image front and center. As the eye travels downward, pictures of faraway mountains and a lone pier graze the bottom of the artwork. In the world of surreal paintings, Christ of Saint John of the Cross is a visually impressive artist’s depiction of a religious figure told in a unique voice. Dali used his skill as a painter to create a clear image that somehow seems to take on a life of its own. The geometric design and realistic color scheme combine to form an impressive show of workmanship.